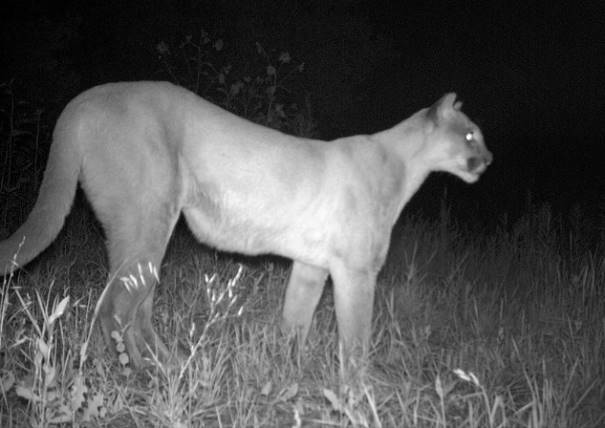 Mountain Lions in the City: What Can We Do? While we listened to residents voice their thoughts on the Bear and Lion Component of the Urban Wildlife Management Plan (UWMP) at the City Council meeting on the evening of April 5th, a female lion was likely looking for her next meal. Where she found it on the morning of the 6th happened to be in the neighborhood to the north of Centennial Middle School. When I arrived on scene she was barely visible behind a log pile, just on the other side of the fence from her partially buried deer kill. About six hours and several surprised neighbors (including Councilwoman Morzel) later we managed to tranquillize her with a dart and relocate her out of town, away from the human populated area. The neighborhood surrounding Centennial Middle School is not a good place for a mountain lion to be. However small the risk to humans, a large carnivore in densely populated areas is concerning to us. What some residents of this neighborhood were learning for the first time, many residents in other neighborhoods of the city already knew: mountain lions will come into and use the City of Boulder and not just west of Broadway but also in neighborhoods commonly thought by the average citizen to be well out of their range. The Division of Wildlife is tasked with managing wildlife in Colorado and that includes individual animals that need to be relocated or destroyed to protect human safety. The Bear and Lion Component of the UWMP is the city’s commendable effort to address the people aspect of the lion and bear issues in the city. Together with the community, the city and we at the DOW are trying to find solutions to the problem of bears and lions being in town. With bears it’s all trash talk (pun intended), but when it comes to lions the solutions are not as simple as requiring bear proof garbage cans. This can be frustrating not only for the city resident who wants something done but also for the policy makers and their staffs. So what are some solutions? What should the DOW be doing? What can the city put in their Bear and Lion Component of the UWMP that would help? Why doesn’t the DOW kill lions that come into town? Let me first explain why we don’t just do this and why I don’t see this as a viable solution. First, there is no evidence to suggest that simply killing lions will lower the risk to people or that it will keep lions from being in the city. The lions that we know of in the city we generally try to trap/tranquillize and remove but we’re not able to do this every time there is a lion reported in town. Further, there are lions that come into town without being detected and lions that come into town that aren’t reported. Finally, even if we were successful at removing every lion that steps into town whether by killing it or relocating it so that there was no chance it would ever come back, as long as there are lions in the rich habitat next to town and there is additional adequate habitat within town, lions will continue to come into town in search of what they need. If the goal is to increase public safety by decreasing instances when humans and lions are in close proximity, killing lions that we get our hands on will not accomplish that. That doesn’t keep us from doing what we can when a lion is in town to relocate it (or kill it if necessary), but whether we relocate or kill it, the greater problem remains. Lions eat deer. Lions also eat smaller mammals. There is no shortage of deer, raccoons, foxes, and skunks in town and areas that are hospitable to these prey items by providing food and cover are also welcoming to lions. Lions need water. Especially in dry years where water is scarce elsewhere, there are always water sources in the city. There are larger bodies of water like Wonderland or Viele Lakes but there are also many water features in backyards that are quiet and tucked away and encourage lions into town from the foothills. Lions use hiding places. Being ambush predators, lions are excellent at hiding (they are not always hunting when they are hiding however, many times they are just hiding). There was a raccoon cached in a yard on 3rd St a few weeks ago. The homeowner was completely unaware a lion was even there until after the raccoon had been completely consumed and we showed it to him. The lion had been camped out under the thick, low hanging branches of a tree. Under decks, among low hanging branches, behind log piles, these are all places I have seen a lion hide and rest. Waterways and ditches are wildlife superhighways. When we receive a report of a lion sighting in east Boulder rarely is it accompanied by any additional sightings of the lion traveling to east Boulder. They can move easily through town unbothered in heavily vegetated ditches and creeks. Using what we know about why lions come into the city we can more effectively act to try to discourage them but possible solutions may not be palatable to everyone and require some additional thought and discussion. Culling deer is an option and one that has been explored by other communities including Craig, Colorado. Craig learned that enough of their citizens did not want the deer culled that they eventually abandoned the idea altogether. I have a feeling the sentiment may be similar in Boulder, but I leave that to Boulder residents to decide as a community. In addition to it being controversial, culling is very costly and requires some form of ongoing year-to-year effort to be a successful population control method. Birth control for deer may be a possibility in the future, but it too would have limitations and it doesn’t make the existing deer go away. Neither culling nor birth control would prevent deer migrating into the city. As long as there is food and space for the deer, they too will stay in town and act as attractants for lions. What about paving or cementing all of the city’s waterways and keeping them well lit? The issue with removing some lion attractants is that many of those attractants are attractive to us too. It might require changing what Boulder looks like. Boulder is a really beautiful city and part of what makes it beautiful is its natural areas. To keep lions out of town completely may take a complete makeover of the city’s green spaces which would be pretty significant for many reasons. Some of those larger community decisions will have to be just that, community decisions and I don’t have easy or definitive solutions to suggest. 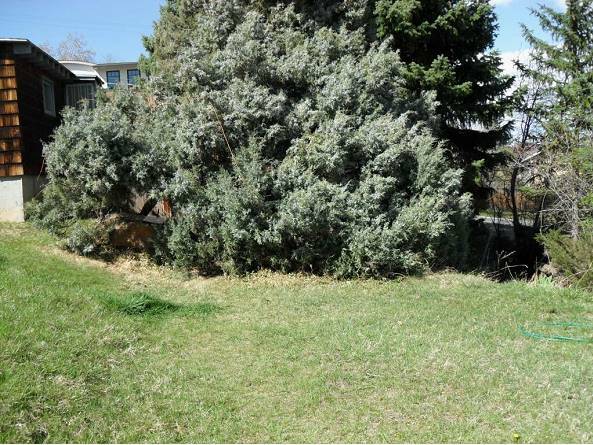 What I can suggest and what City of Boulder staff recommended to council is that the individual be empowered with awareness and knowledge about the fact that not only do lions come into the city but what they in turn can do to make their property less inviting. Plantings that are inedible to deer, removing spaces where wildlife can hide (both lions and their smaller prey), and finding alternatives to water features in landscaping are all things individuals can do. If the current informal way we notify some residents via email of reported sightings and activity could be improved more residents could be aware and informed about lions in Boulder. There is one final note I’d like to make in the discussion. I know many long term residents, based on their experiences, observe that this problem of lions coming into the city was never a problem until recently and the real solution lies with fixing or changing whatever has caused this shift. Theories for this increase include lions becoming more acclimated to people, the lion population increasing, suburban development in the foothills, more deer, less deer, absence of lion hunting, or even not so much an increase in frequency of lions being in town but an increase in sightings and reports (i.e., more people seeing and reporting lions not more lions). These along with other hypotheses and speculations are practically un-testable and the truth is we don’t know. In this instance I don’t know how helpful looking to the past and asking an unanswerable question is to assessing the present situation. As we continue to find solutions the DOW will continue to manage individual lions depending on the situation. We will also continue to work with the city and residents on solutions and tools by continuing to give input to the UWMP. What we can do about lions in the city is act on an individual level to be educated and aware, and on the community level to participate in the discussion about what else there is to be done and to what lengths we want to go. Are Conservation Easements Meaningful in Boulder County?